Design thinking is, above all, a highly specific mindset encompassing a wide range of practices and methods used by designers. The approach, which ties up together all these actions within a common methodology, has managed to make its way into the corporate world and win a seat at the table next to other, more linear, processes. The design thinking is a paradigm shift, from product-centered design to human-centered design, it borrows many practices from ethnography, sociology and other deep contextual customer research. It starts with user data, creates design artifacts that address real and not imaginary user needs, and then tests those artifacts with real users. Design Thinking is a banner for different approaches, they differ in their outcome and the origin of the problem. Design Thinking (also known as Meta Design Thinking, Strategic Design Thinking) starts with a systemic vision with no outcome assumptions and results in diverse outcomes. Product Design Thinking starts with product creation assumptions and results in product outcomes. Service Design Thinking starts with service creation assumptions and results in service outcomes. Experience Design Thinking starts with experience creation assumptions and results in experience outcomes. 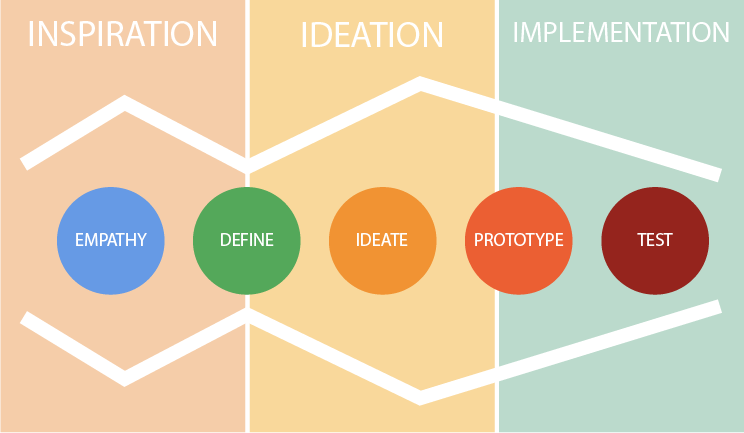 Two processes of the Design Thinking are popular, one with 5 steps from the d.school and another one with 3 steps from IDEO, each one can bring you a meaningful structure for your creativity process. Design Thinking is not a linear process and you can go from one step to another easily. When you're testing your solution, it may be useful to have empathy with your customer or the situation and sometimes, you need to re-define your problem in the light of the latest developments. Keep in mind that empathy is a key quality for design thinking, as the ability to understand your customers to answer their needs. This empathy insures you to address real problem and give meaning to your solution. A wonderful interface solving the wrong problem will fail.